Shopping for a new kitchen range can be fun if you know what you need to look for and have a plan in place before you head to the store! Whether you are replacing an existing model or buying one for the first time, there is a lot to consider when choosing a new gas or electric range. We've simplified the process with our Range Buying Guide. In this detailed overview, we'll give you 6 important steps to ensure success when making your next purchase. Be sure to read this guide before heading to the store! In a Hurry? Check Out Our Video on Choosing the Perfect Range! Unless you are building a new home, you may not have much choice when it comes to gas or electric as your home will likely already have a connection set up for one or the other. However, if you have the option, either because you are building a new home or fortunate enough to have both connections available, you'll want to know whether you'll need a gas or electric range model before shopping. Gas stovetops are a favorite among cooking enthusiasts since gas allows for greater control of the heat, so it's easy to make adjustments quickly. If you have a gas hookup, be sure to let your salesperson know if it is for natural gas or LP (bottled) gas. Most ranges have an LP conversion option available but the conversion will need to be done prior to delivery. A gas range, on average, costs about $100 to $150 more than an electric version of the same model. You might be familiar with the traditional coil top electric range, but new models today often come in a smooth top design that's easy to clean and has a more premium feel. 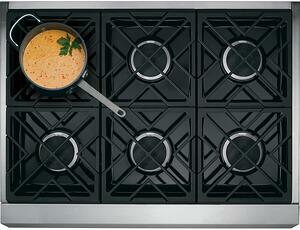 Smooth top ranges feature a ceramic glass cooktop with the burner elements concealed underneath. Electric ranges generally require a 240 volt outlet while gas ranges generally require a gas connection and a 120 volt outlet. There are also dual fuel options and induction ranges, which we'll discuss later in the Terms & Features section. There are a few different types of range styles. Which type is right for you generally depends on your cabinet configuration and aesthetic preferences. A free standing range is a range with finished sides that fits into a standard opening, and is usually 30" or 36" wide. These ranges are simple to install: just place them in the opening between the cabinets. There is no special installation required and no special configuration of the abutting countertop or cabinetry required. Because these ranges have finished sides they can also be installed where there is only cabinetry on one end where one finished side of the range is exposed. In fact, they can also be utilized in settings where there are no cabinets at all and the range just stands on its own. These types of ranges are very common in many homes, condominiums, and apartments. Slide in ranges are ranges that typically require a special opening for installation between cabinets. They often, but not always overlap the countertop on the sides and sometimes in the rear to give a built-in look. Slide in ranges generally have all of the controls in the front, above the oven door. Many people like slide in ranges because they provide a cleaner, more finished look. Without rear controls, they also offer more backsplash options behind the range, further adding to the aesthetic appeal . In the past, most slide in ranges were not full depth and did not have finished sides. They also typically overlapped the countertops. This is changing. There are many new ranges that people refer to as slide in ranges that are full depth, don't overlap the countertops and do have finished sides. What sets them apart from traditional free standing ranges is that they have a sleek design and always have the controls in the front with no back panel. These are the rarest type of range. They were popular a few decades ago but can still be relevant, especially for those replacing an existing drop in range. These ranges are like slide-in ranges, but they are suspended by the counter surface and do not touch the floor. They lack a warming drawer or storage area as a result of this design. They are usually direct wired into a junction box behind the range, and are more likely to be available in electric than gas. 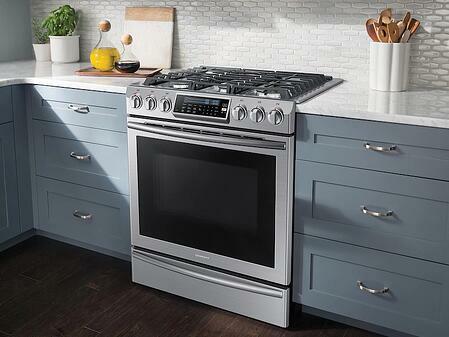 If you are looking for a built-in look, it may be easier to install a wall oven and cooktop rather than a drop in range. When discussing range dimensions, width is really the only issue that matters. For the most part, almost all ranges, with the exception of drop in ranges and some true professional ranges, have the same height and depth of around 36" at the stove surface and 25", respectively. This is because kitchen counter heights and kitchen cabinet depths are virtually universal. Width, however, is a different story. When talking about a "standard" range, the industry standard is 30" wide. The majority of kitchens in the US are constructed to accommodate a standard 30" range. This opening will typically accommodate a matching 30" standard ventilation hood or over the range microwave above. The next width is the 36". This is the entry level for the professional range category. These ranges obviously have larger ovens and more cooking surface on top. Next up, in the ultra-premium market, is the 48" range. This is a true professional range for the high-end kitchen. There are some ranges with in-between dimensions like 40", but 30", 36", and 48" are the main dimensions you'll see. It is important not to overlook the smaller end of the spectrum as well. The next standard size below your everyday 30" range is the 24" range. These ranges are typically found in apartments but can also be found in condo style homes, mostly in urban areas that have smaller kitchens. They can also be found in RVs and in the modern "tiny houses" that seem to be increasing in popularity! The best gas range or electric range in terms of size will be the one that suits your existing space or the new space you are designing. The next step in our range buying guide, now that you've narrowed down the fuel, style, and width of the kitchen range you need, is to consider different features and options that you may like to have in your new oven and stove. Below are a few examples, but it is by no means an exhaustive list. 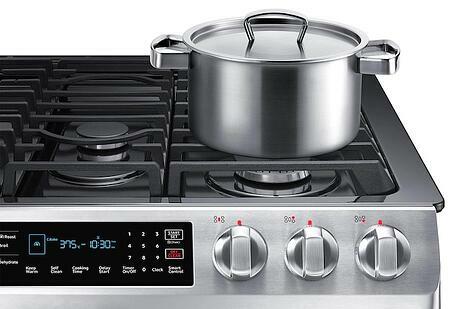 These ranges operate with electricity in the oven and gas for the top burners, combining the best of both cooking fuels. Learn more about dual fuel ranges in our article! In these specialty ranges, the cooking surface doesn’t get hot. Magnetic power is used to heat the cookware, so the cookware itself becomes the "burner." Induction ranges are faster and more efficient than electric ranges, but don't work with some cookware materials, such as aluminum. Induction allows you to control the heat instantly, somewhat like a gas range, because there is no heat transfer from the cooking surface after you turn the burner setting down. This refers to gas ranges which have the burners sealed into the top of the range, eliminating the need to clean under the top surface. Almost all of the best gas range models now come with sealed burners (click the link to learn more). The size and configuration of the burners is something to take a close look at. 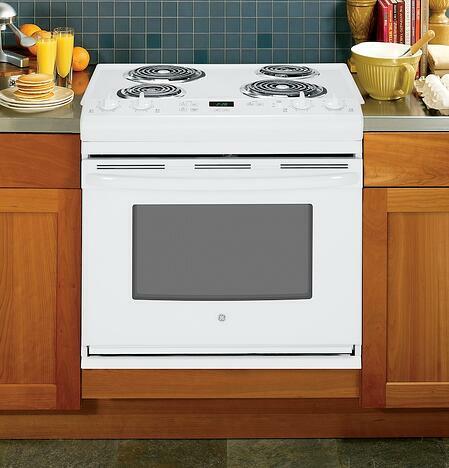 Many standard 30" ranges have four burners while others have five burners or separate warming areas. There are also quick-boil and other specialized burner styles. Larger 36", 40", and 48" ranges have more burners and different layouts. In choosing the best electric range or best gas range, burner size, power (in BTUs or watts) and configuration are often some of the most important factors. 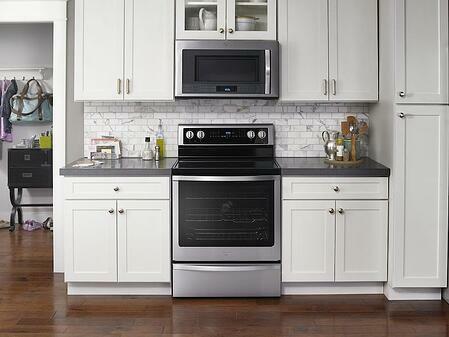 Various brands have come out with smart appliances, including Samsung, GE Appliances, and Whirlpool. 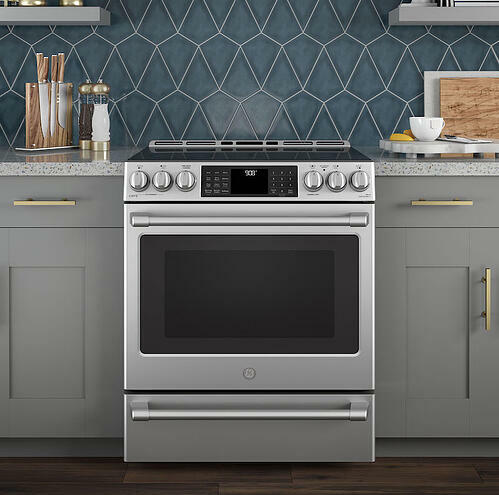 If you're looking for smart appliances that are specifically related to your stove, check out Whirlpool connected appliances and GE's Kitchen Hub! In self-cleaning ranges, the ovens are cleaned with heat, usually about 900 degrees, for a period of 2-3 hours. This reduces any food debris and drips to ashes, which can then be easily removed with a damp cloth. 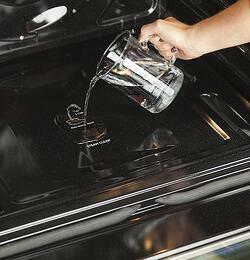 Self-cleaning oven cycles are an alternative to using oven cleaning products. Ranges with steam clean cycles require you to put about a cup of water into a reservoir in the bottom of the oven, which is heated for about 20-30 minutes and loosens all of the spills and splatters on the oven walls. This allows you to wipe the oven clean with a soft cloth. True European convection ovens have a fan in the back of the oven with a heating element around it. The fan draws air in from the oven, superheats it and sends it back into the oven. This action makes the heat in the oven very even, gets the heat to the food faster, seals in juices, and speeds up the cooking process. Dual convection ovens are designed the same way, but have two fans in the back of the oven to do an even better job of cooking quickly and evenly. Fan convection ovens have a fan in the back of the oven, which draws the air in and sends it back into the oven to eliminate hot and cold spots. Fan convection ovens do not have the heating element around the fan to heat up the air being distributed. Double oven ranges have two oven cavities, which allows you to cook two different recipes at the same time at different temperature settings. They come in different styles with different oven sizes. Most models have a smaller oven at the top and a larger oven at the bottom. Double oven ranges do not have storage drawers. Some ovens now come with built-in temperature probes or meat thermometers so you can easily monitor the progress of a dish from a distance. Some ovens will even switch to a "Keep Warm" setting after the desired internal temperature of the food has been reached. The most inexpensive 30" ranges start in the $400 - $500 range. Obviously, at an entry-level price, you will get basic features. 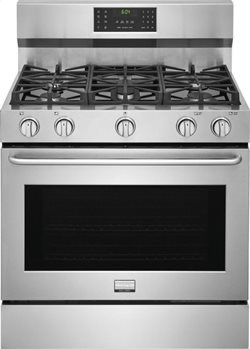 These models include coil top electric ranges and gas ranges. Several brands offer these basic budget ranges, including Hotpoint, GE Appliances, Amana, and Premier. We've reviewed Hotpoint ranges as well as Amana range options if you are interested in learning more about these cheaper models! As you move up towards $1,000 you'll get more and more features. In these low to moderate price ranges, you'll pay about $100 more for gas versus the comparable electric model with the same features. In the $800 to $2,000 price category there are may features available and you'll be opened up the worlds of induction, double ovens, slide in ranges, and so on. Above $2,000, you'll find mostly higher end slide in ranges and start to get into true professional ranges and larger sizes like 36", 40" and 48". Fueling: gas or electric. 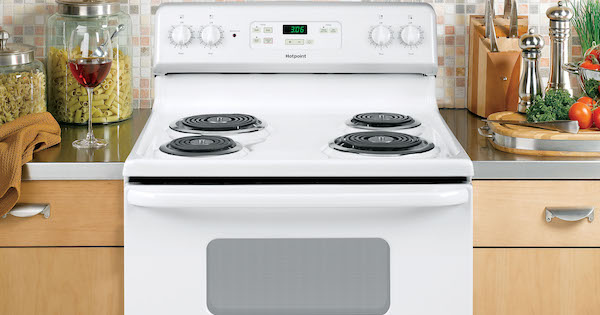 Do you need an electric range or a gas range? If you're going with a gas range, be sure to let your salesperson know if you will be fueling it with natural gas or LP gas (propane). For an electric range, you'll need a 24o volt electrical outlet. Range style options. Choose the style of range that best suits your needs: free standing, slide in or drop in. Choose the size of your range. Will you need a standard 30" model or are you looking for a smaller apartment style 24" model? Or just the opposite: a larger professional type model in 36", 40", or 48"? Have an idea which specific features you'll want. 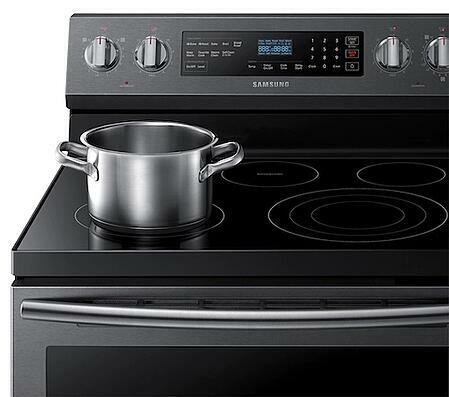 These features include cooking options like dual fuel and convection and stovetop options like induction. Also, decide on the number of burners you want and look at the burner strengths in terms of BTUs or watts (depending on the fuel). Know how much you want to spend. There are a lot of nicely featured models out there at mid-end price points. You may also benefit from appliance rebates or appliance packages! You can also download our complete 28-page Range Buying Guide in PDF format. It's FREE and packed with even more details about the topics covered above and more! 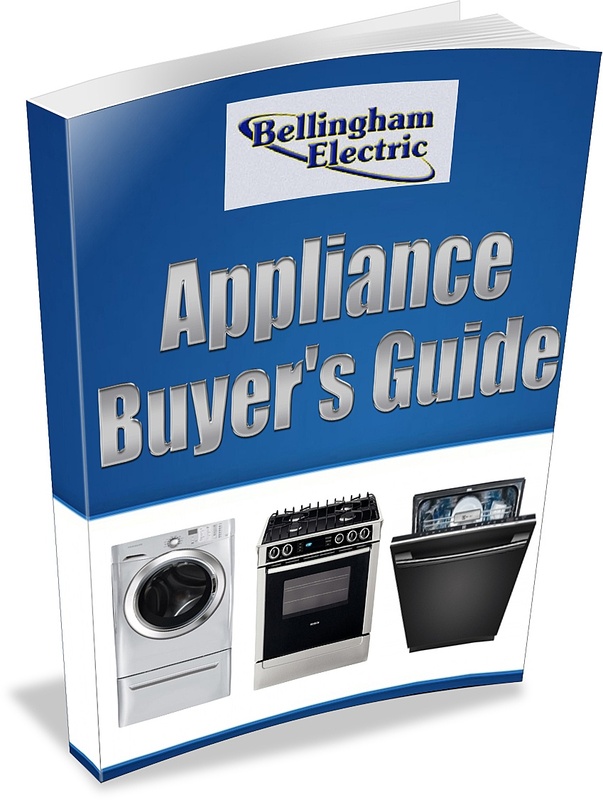 Want to learn more about buying appliances? Click here to download any of our Buyer's Guides on various product types. These illustrated guides are 20 to 30 pages in length and packed with great tips! 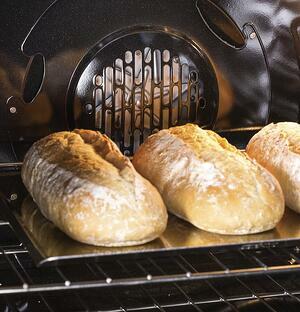 You may be interested in our Ventilation Buyer's Guide or Wall Oven Buyer's Guide for cooking appliance upgrades!